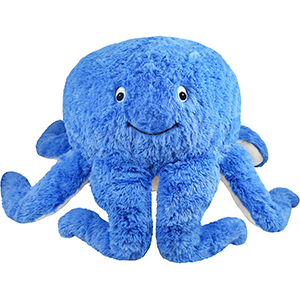 Squishable Blue Octopus: An Adorable Fuzzy Plush to Snurfle and Squeeze! What does the world need right now? A cephalopod with focus! While it's true that an Octopus can do eight adorable activities at once, this one knows better! He disdains duplication! He maligns multi-tasking! Just because his eight limbs can hold a large number of items at the same time (phone, tablet, pen, daffodil, and four different kinds of cannoli) does not mean that he does! His focus is centered on one goal and one goal only: cuddling YOU. It is his purpose and his mission, and he's goshdarn good at it. Also, this Octopus is blue! Blue, according to color theory, represents coolness! Therefore this is one cool mono-tasking Octopus! Hug him and expect eight times the single-minded love back!!! STORY TIME: the original octopus was the first squishable I ever discovered, and this was years ago--back before the minis existed--so I had to be content with pining from afar because I had no job and still lived with my parents. And then I found the minis and life was beautiful. BUT THEN, THEN Squishable had to go and make this big mushy boy in *blue* and *rainbow* too, and I died a little every time I went on this site and didn't get myself one because I wanted to. But this story has a happy ending because there was a good sale and my willpower finally ran out, and now I have my very own Oswald and he is such a good hugger and I LOVE HIM SO MUCH (and everything was beautiful and nothing hurt). I'll be honest, the picture does not do this adorable octopus justice. I got Oscar for my birthday while my sister got the pink octopus, and I LOVE him!!! He's so adorable, and he's one of my favorite stuffed animals! He's a great companion when I'm working on college essays or studying for exams, and I always have him watching me draw and play video games. Such a beautiful and adorable octopus, and I'm happy he was my first Squishable! My brother gave me Emil, my flufftopus, a few years ago for Christmas. I am 31 years old and autistic. I work as a disability rights advocate in Washington, DC. At the end of a long, sometimes stressful day, I love having something soft to hug. Thanks, Squishable! I love this thing to death! It is so adorable. I named him Jinkies and is SUPER SOFT. I would highly recommend this for anyone. He is a perfect addition to my Squishable collection. This is good for anyone. I got him for Christmas and was so happy. This is perfection!